I used to enjoy campus novels – stories about university life – immensely. As a mature student, I soaked up the BBC’s 1981 adaptation of Malcolm Bradbury’s The History Man with Anthony Sher as Howard Kirk, gripped by the unconstrained, free-thinking lifestyle it portrays, and wanted it for myself. Not until I read the actual novel many years later did I realise what an objectionably selfish snake the anti-hero is. Later, having somehow pulled-off the unlikely trick of getting a job in a university, I was greatly entertained by David Lodge’s campus trilogy, Changing Places, Small World and Nice Work, written in the nineteen-seventies and nineteen-eighties. There was a lot in the wranglings between staff, pointless activities and scrabbling for advancement that rang true, as did the chaos lower down the academic hierarchy depicted in Tom Sharpe’s Wilt which I experienced first-hand on moving to a Polytechnic. 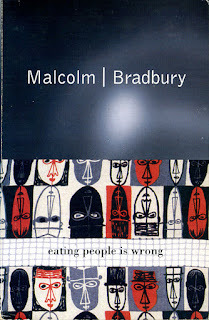 In recent weeks I have been catching up on two early campus novels from the nineteen-fifties: Kingsley Amis’s Lucky Jim and Malcolm Bradbury’s Eating People is Wrong. 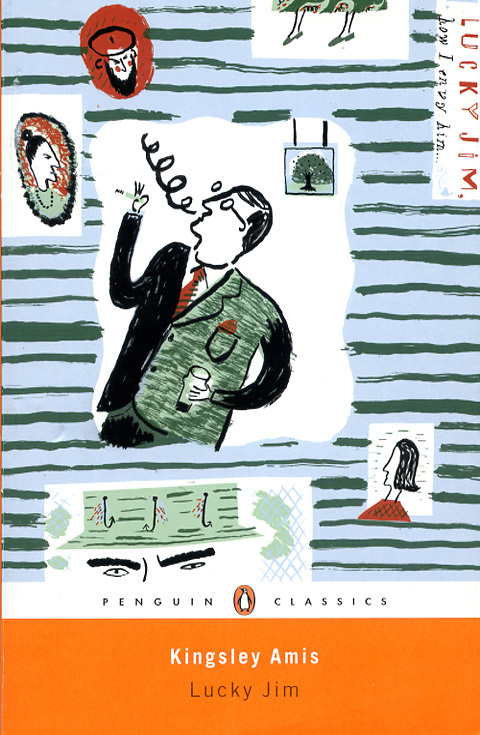 Both books are very much of the nineteen-fifties in the social attitudes they portray. I guess they helped frame the way we thought of provincial universities during the nineteen-sixties when I was at school, unsuccessfully applying through UCCA. I found myself sympathising with the predicament of misfit young lecturer Jim Dixon, and felt very satisfied at the end when he walks off with the girl and everything else. However, many of the comic situations, for example when Dixon accidentally burns holes in his Head of Department’s bedsheets whilst staying at his house, and his subsequent attempts to conceal the damage, could be in any comic novel rather than one specifically set in a university. It could be from a Brian Rix Whitehall farce. I might well look out for more by Kingsley Amis. 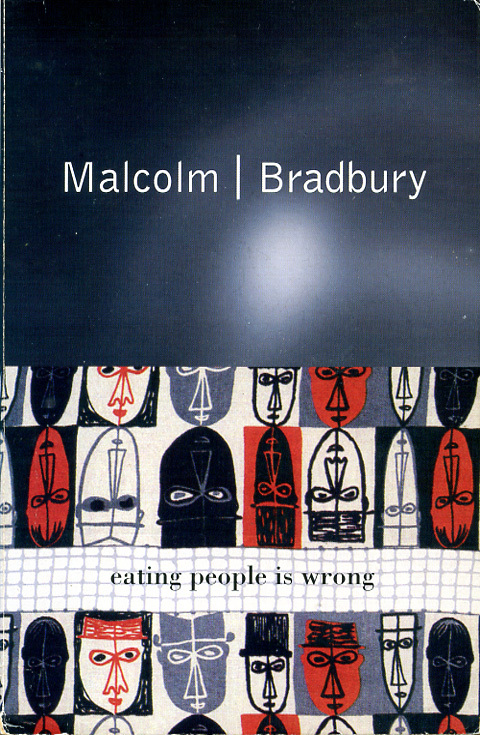 Eating People is Wrong (1959) I found less than satisfactory. 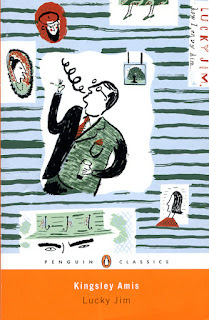 It concerns the prematurely old-fashioned Professor Treece and his difficulties in making sense of the changing post-war world of the nineteen-fifties. There are too many characters, none very likeable, most under-developed, too many switches of viewpoint from the thoughts, opinions and dilemmas of one to those of another and then to those of the author, and a tendency to tell rather than show – all the things that writing experts say you should avoid, but who are they to find fault with the acclaimed founder of the famous MA in Creative Writing course at the University of East Anglia? It is no real defence that these things appear to be conscious and deliberate. With sociology one can do anything and call it work. … if you are interested in [old] houses, you know what the world is like and it is not like you. … soon it won’t be necessary to go to America. It will all be here. Was Bradbury referring to himself? Having grasped all of this, scoring it two stars is mean. I’m sure I would get more out of it on slow second reading, but life’s too short.